Abby the Librarian: What Sank the Titanic? A couple of weeks ago, I held a STEM program at my library investigating the science behind the Titanic disaster. It was a really fun program and I want to share what I did. I pulled a lot of inspiration from Amy Koester's program Sink or Float: Titanic Edition and pulled some activities from the Titanic Science Activity Guide (opens a PDF). 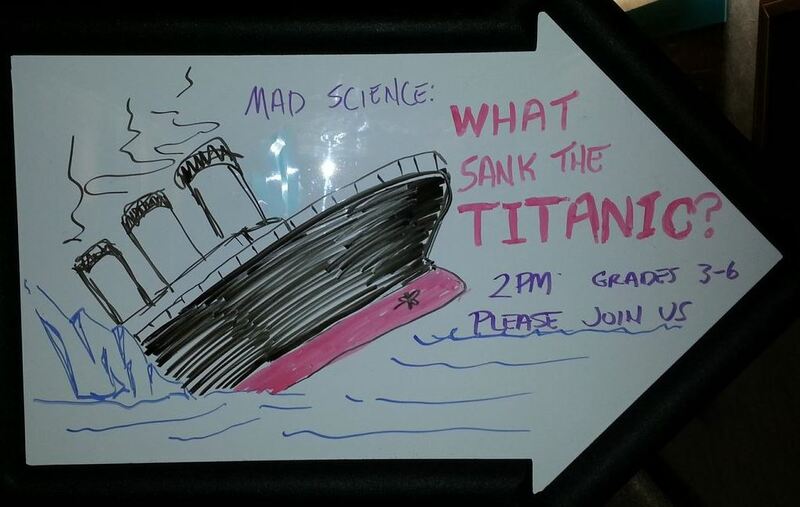 I've also done a different Titanic program at my library a few years ago, but that one wasn't centered on STEM concepts. I always want to center my science programs around literature and utilize the awesome nonfiction books we have in our collection. For this program, I chose several passages from the fantastic book Titanic: Voices from the Disaster by Deborah Hopkins and read them throughout the program. I started out by introducing myself and reading a passage from the book. I read the short passage about the Titanic's cat and how she carried her kittens off the ship shortly before the ship launched (found on page 16). Then I asked the kids what they knew about the Titanic. They were happy to share facts with me and almost everyone knew at least one fact to share. Next, we talked about buoyancy, the force that pushes upwards on objects in water. I demonstrated the concept of buoyancy with modeling clay (as found in the Titanic Science activity guide, linked above). 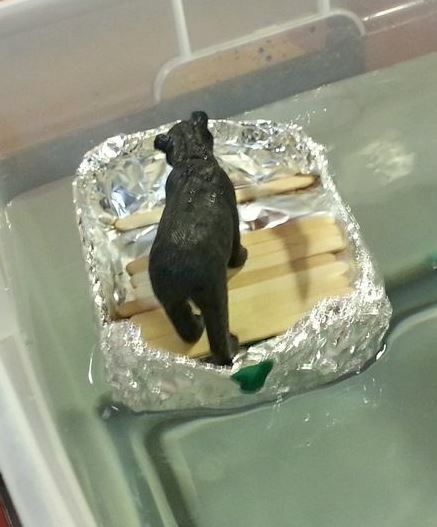 My helper had made a boat out of modeling clay, which floated due to the large surface area. When I squished up the modeling clay into a ball shape, it sank because the surface area was smaller. As I did each step, I asked the kids to predict what they thought would come next. Then I read another passage from the book, the first page of IMPACT on pages 73-74 and we talked about icebergs. 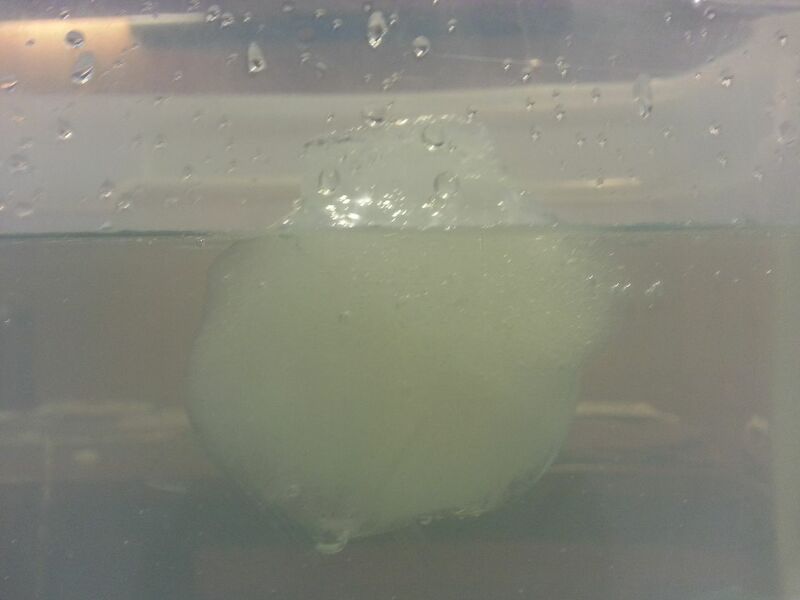 I had created a model iceberg for the kids by freezing water in a balloon. The kids noticed how most of the iceberg was underwater, which made the iceberg hard to see. Next, I read a passage that talked about the damage done to the ship (pages 84-85) and demonstrated the Titanic's sealed compartments with an ice cube tray. I found a spread in the book Story of the Titanic by Steve Noon which showed a diagram of the Titanic and the bulkheads that separated the compartments. I passed that around to show each kid and then showed them how the ice cube tray could float with a certain number of "compartments" flooded, but started to sink after several were filled with water. I also did a demonstration to illustrate water pressure using a 2-liter bottle (found in the Titanic Science activity guide). This showed the kids that water pressure builds as you go deeper and that made the water gush in very fast because the holes made by the iceberg were fairly deep under the water. The activity guide has some facts about how fast the water came in, which I also shared. 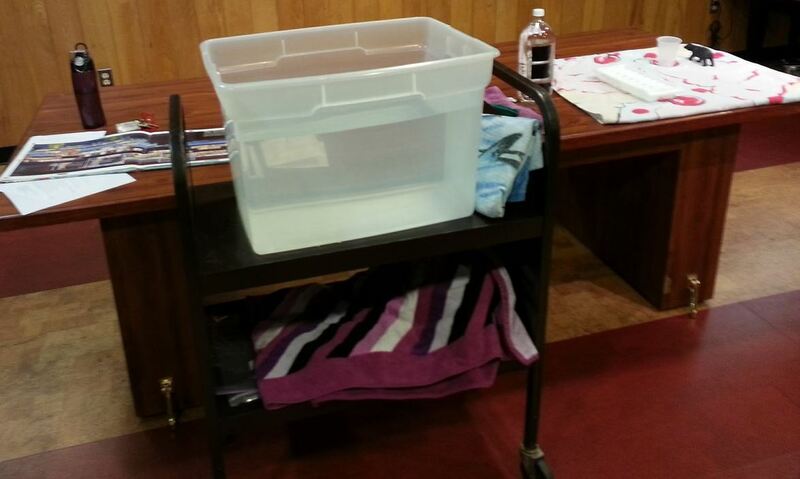 Have many, many towels available! You can't have too many towels! I provided: modeling clay, craft sticks, aluminum foil, pipe cleaners, and bits of yarn and ribbon that had been cut for some previous craft program. I found that many of the kids wanted to use the modeling clay, despite the fact that it was a fairly heavy material compared to the other materials. We had lots of sinking clay ships, giving us an opportunity to talk about surface area and buoyancy! - Try out each demonstration before you do it! I discovered on my trial run that the tub I thought I'd use had a crack along the bottom and water was leaking out. It's definitely a best practice to try everything out and make sure it's going to do what you think it will before you try it in front of a room full of kids. 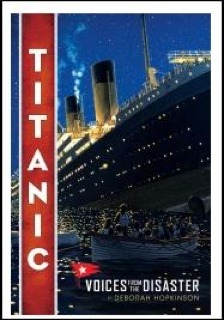 - This is a great time to display your Titanic books! We had a nice crowd for this program on a particularly beautiful Saturday afternoon, so I call that a successful science program! And hey, it's Nonfiction Monday! Head on over to A Mom's Spare Time for this week's roundup!